It’s kebab season here in the D’souza house, and today we are talking about Kachhe Kele ke kebab, made with green plantains or raw bananas and which just happen to be vegan and gluten free. A big plus for all my friends with dietary restrictions! Every time I make these I wonder why I don’t make them more often because it’s amazing how much I love them when I do. Like yesterday, when I made them in the afternoon, and ended up having three of these AFTER I had had a big lunch. And then a few more for dinner with some pita bread and hummus. Which BTW is a killer combination. Also try chutney, chapatis and kachhe kele ke kebab all wrapped like a kaathi roll. These are insanely easy to make and so delicious in spite of not having all those unhealthy ingredients which make every thing taste better. The potatoes are subbed with healthier raw banana, the flour or breadcrumbs or whatever you use generally as a binding agent is subbed with buckwheat flour and there is no ginger, garlic or onions so it’s even Navratri proof. I’m seriously digging these bad boys because they are so damn healthy! And they are fantastic in wraps, salads or just as snacky bites in the evening. This morning, they are going on toast with some buttery avocado as a base. Am I weird, because that’s like three meals in a row! But umm, there are two of these left and I better make good use of them, if you know what I mean. Try them with some Cucumber Mint Raita, or a big dollop of Coriander Chutney! These kebabs heat up well in the microwave or on the stove, and can be refrigerated for up to 3 days! 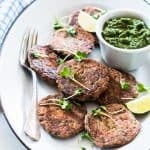 Kachhe kele ke kebab are made with raw bananas or green plantains and are a healthy and nutritious snack, particular during Navratri. Check out this easy recipe which is also vegan and gluten free! Cut each plantain in half and pressure cook or boil till the plantains are cooked through. I pressure cooked them for 3 whistles or about 15 minutes. Peel the plantains, and add them to a bowl along with kuttu atta (buckwheat flour), ground black pepper powder, green chillies, coriander and sendha namak (rock salt). Mash the plantains and mix well with the ingredients. Form the kebab mixture into flat, round balls about one and a half inch in diameter and set aside. Heat oil in a non stick skillet, and add the kebabs one by one, making sure they don’t overlap. Cook each kebab for 8-10 minutes on each side till they are golden brown. I cooked these in two batches. 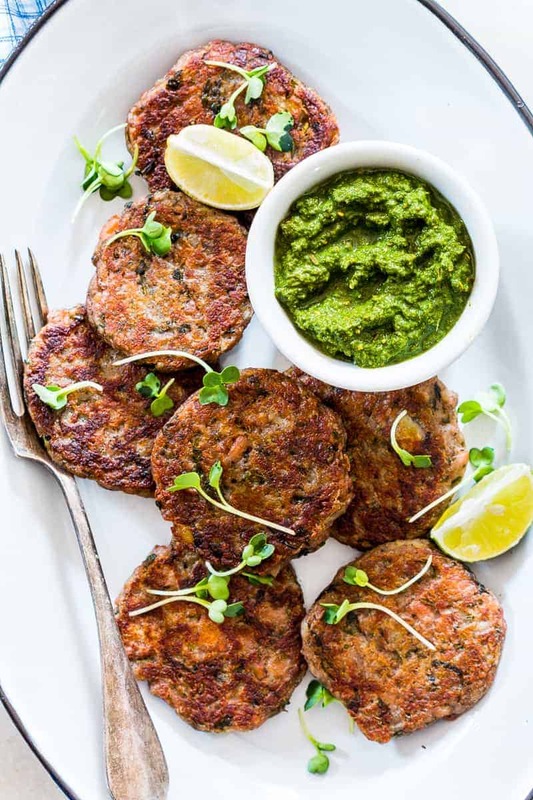 Serve these kachhe kele ke kebabs with coriander chutney. Thank you or sharing this jus when I was struggling to pack healthy bites in my office box.